Joie de V: July Giveaway! I'm so excited to announce my July giveaway! Lately, some of my favorite activities have been connected with coffee. Spending time with my friends, sipping and chatting away while our little ones play (well, mine watches intently while the others play) is one way; the other is when I enjoy some Me Time to study or write, my favorite drink in hand. 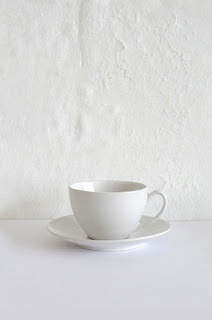 For my July giveaway, one reader will win a set of four Billy Cotton white stoneware cup and saucers! Aren't they pretty? I think they're the perfect companion to a cool summer morning or to bring out when your friends stop by. To be entered to win, follow the blog via Google Friend Connect and leave a comment below. The winner will be announced on July 16! These saucers are so lovely - I like their classic style! Oooh and of course following your sweet blog now from The Aloha FRIDAY Hop.